Minneapolis will soon be the home to the T3 building- America’s first modern tall timber building. T3, which stands for Timber, Technology and Transit, will be a 7 story office building made with nail laminated timber panels (NLT). Michael Green Architecture and DLR Group designed the building and it is being developed by Hines. As you can see in the picture of the building, not everything in T3 will be wood. The elevator core, parking level, and foundation are all concrete. Crews recently began to erect the wooden panels on the glue laminated (glulam) post and beam frame. Read more about this momentous building in MinnPost’s Into the wood: America’s first modern tall timber building rises in Minneapolis. 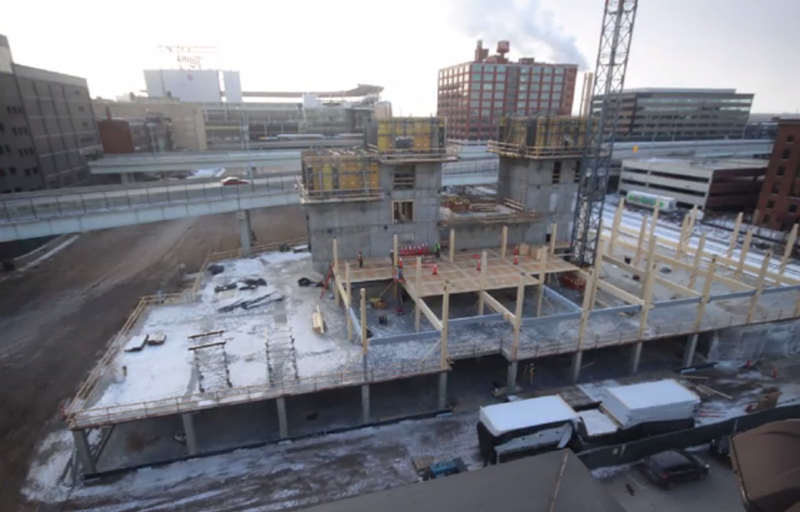 As a bonus, you can even view a work zone construction cam and watch a time-lapse of the progress!